FILE - In this photo taken Oct. 26, 2015, youths supporting the opposition party dance and chant, predicting a win for their candidate, outside the Electoral Commission office in Stone Town, Zanzibar, a semi-autonomous island archipelago of Tanzania. Zanzibar is preparing for an election rerun Sunday, after polls were nullified in the region last year. Zanzibar is preparing for an election rerun Sunday, after polls were nullified in the region last year. But the main opposition party is urging a boycott, and problems with ballot papers are causing many to wonder how a rerun will result in a better electoral process. Three days after Tanzanians cast their ballots in national elections last October, Zanzibar Electoral Commission Chairman Jecha Salim Jecha announced he would be annulling the island’s elections and holding new ones due to “violations of electoral law.” The opposition has dismissed these claims. Zanzibar Law Society president Omar Said Shaaban says the constitution allows for the electoral commission chairman to nullify polls on or before election day. “But this time, nullification happened three days after the election day, which is not something constitutionally provided,” he said. That makes this election season unprecedented for Zanzibar, a semi-autonomous region of Tanzania. Shaaban says the region has experienced election nullifications in the past, but not days afterward. FILE - The opposition Civic United Front (CUF), Zanzibar's Second Vice-President Seif Sharif Hamad speaks during a news conference in Dar es Salaam in Tanzania, January 11, 2016. 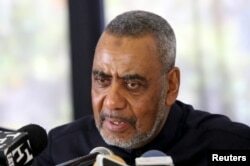 Zanzibar presidential candidate and leader of main opposition party Civic United Front, Seif Sharif Hamad, declared himself winner of Zanzibar’s presidency last October before results were announced. Hamad has stated the October election was free, fair and valid, and without grounds for nullification. He is urging a boycott of Sunday’s rerun elections, with support from several other opposition parties. “So far, what we have noticed on the ground is everybody is sort of supporting the position of their party leader that they will not participate in the 20th of March election,” he said. Shaaban argues another problem is the election commission is not properly disseminating information to citizens. "For example, recently we have noticed that one of the candidates, his name has been wrongly written in the draft ballot paper, and that has created very public concerns on that, whether we will have elections on the 20th, if the ballot paper, the name of the candidate has not been written properly, that means that that candidate is not contesting in this election or this rerun. Now, ZEC has not come forward to explain to the public of what they are doing to fix that,” he said. Recently-elected Tanzanian president John Magufuli, of the CCM party, has endorsed these new elections, a move some believe gives Zanzibar president and fellow CCM party member Ali Mohamed Shein another chance at staying in office. Zanzibar residents vote for Tanzania’s president, Zanzibar’s president, members of the House of Representatives, and local officials. October ballots cast for Tanzania’s president were still counted in the national election, as Tanzania’s national electoral commission, not Zanzibar, handles that process. The constitution says the country's first vice president should come from the party whose candidate is awarded second place. Without the Civic United Front participating, this individual could have problems gaining the support of many Zanzibaris, deepening the Zanzibar political crisis.